The prewriting and writing readiness phase: Includes planning in terms of the logistics, the purpose of the writing, the main topic of the writing and the key components of the writing logistics. Mind mapping: A technique of increasing popularity that is used by authors for organizing one's thoughts for a writing project and the preparation and planning associated with it, in addition to other things. A mind map is a graphic display of thoughts. Writer's Block": A common barrier to the writing process. Simply defined, writer's block is an individual's inability to produce a piece of writing and/or to come up with some plan, or outline, for the piece of writing. Stage 5 of the writing process: The Printing, Publishing and/or Submitting the Final Document phase of the writing process that includes necessity of the timeliness of the document submission and the proper submission of the piece of writing to the correct person, persons or group in the required form and format and with any accompanying information and documents that may be required by the person or group, such as a professor or a publishing company, who will be receiving the document. Similar to so many other processes like the conception process, the problem solving process, the decision making process, the developmental process and evaporation process, the writing process is not an event or a product; the writing process is a systematic, step by step way to move from point A to point B, etc. until the process is complete and the product of the process becomes apparent and complete. Although there is some debate in terms of the titles of each of the writing process' steps and the number of steps in the process, most agree that there are five steps in the writing process. Prewriting and writing readiness are the two major aspects of the first stage or step of the writing process. Prewriting occurs before any pen touches a paper and before any key is pressed on a computer keyboard for a word processing program. Prewriting entails planning, thinking and reflection about the entire writing project and the main components of a writing passage. Logistics include such things as thinking about and planning the physical location where the author will be doing the writing and planning for the time that the author can set aside for work on the writing project. It is typically most beneficial for a writer to plan on using a physical location for their writing that is physically comfortable and away from any distractions and disruptions that can seriously impede the progress in the writing as well as the quality of the writing. It is additionally important to use time management and time budgeting in order to commit to times that the author can, and will, work on the writing project. Determining the purpose of the writing. Prior to planning the content of the writing, the author must engage in efforts and activities to clearly decide upon and determine the purpose, or goal, of the writing project. A clear purpose of the writing provides the piece of writing with its basic foundation which is vitally necessary for a coherent and unified piece of writing. For example, is the purpose of this writing project to communicate with others in the business environment? Is the purpose of this writing project to fulfill a school course requirement? Is the purpose of this writing project to present a fictional story or a non fictional topic? Is the purpose of this writing project to describe something? Is the purpose of this writing project to persuade others to your point of view? Is the purpose of this writing project to debate your point or belief? Determining the main topic. The main topic of a written text must be identified and understood in the same manner as the purpose of the writing was. The main topic of the piece of writing must be consistent with and supportive of the purpose of this writing. The main topic is often referred to as the controlling idea and the key ideas of the writing, as discussed below, are often referred to as supporting ideas for the main topic. Developing the key ideas and the key components of the writing. The author must now plan the key ideas and the key components of the writing after a decision about the main topic of the writing is decided upon. All of these key ideas and key components must logically and systematically support the main topic and the purpose of the writing. Many authors have difficulty with the planning part of the writing process at times, and this indecisiveness most often occurs on an unpredictable basis. For example, the author may be able to think about and decide on the logistics of the projects including the location where the writing will occur and the time allocation that must be allotted for the writing project, however, they may have difficulty with deciding on the purpose of the writing, the main idea of the writing, the key ideas and the approach that they will take in terms of the style and the tone of the writing. Discussions with others on a one-to-one basis and group brainstorming can often cultivate creative writing ideas. Authors can utilize these strategies in order to overcome barriers and barricades that interfere with the author's planning process. Mind mapping is a technique of increasing popularity that is used by authors for organizing one's thoughts for a writing project and the preparation and planning associated with it. 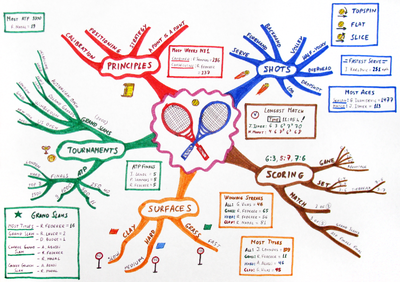 A mind map is a graphic display of thoughts. In addition to authors' using mind mapping for this purpose, mind mapping is also used by the readers of a complex text to increase one's comprehension and understanding of complex things and reading passages and mind mapping can also be used to take lecture notes during an academic class or lecture. This note taking strategy using a mind map will be discussed below in this section of the TEAS examination review. This type of mind map generation is very useful and helpful for a person to generate and organize ideas and content for a writing project. In fact, some prefer the use of a mind map over the generation of a traditional outline, as shown below. Both the outline and the mind map can serve the same function and purpose in terms of organizing one's thoughts for a writing project. An traditional outline, as contrasted to a mind map, for a writing project typically consists of a framework such as the one below. In addition to the use of a mind map for generating and organizing ideas for a writing assignment or project, mind maps are used by many to take notes during a lecture in high school or college. Indecisiveness can be overcome during the Prewriting and Writing Readiness phase by making a commitment, even if it is a temporary commitment, to something with the knowledge that there is still time to change one's mind about any and everything that the author has made a temporary and tentative commitment to. This phase of the writing process is only the first stage of several stages of the writing process and as the author moves along this process there are multiple additional decision points that offer the author the opportunity to change their mind in order to improve the quality of the writing. A reluctance to establish and commit to a time management schedule to insure the completion of the writing process is quite common among authors, including students. Student, therefore, should know that writing term papers and research papers is a necessary part of undergraduate and graduate level studies. It is a "necessary evil" that cannot be eliminated. If a student is committed to get a degree and graduate, the student must make a commitment to the requirements of that degree, including the authorship and submission of high quality academic term papers and research papers. It is necessary, therefore, for students to establish and commit to a time and a place where the student can fulfill this inescapable and mandatory requirement for academic success and graduation. The consequences of not doing so can, and will, include a failure to complete the student's intended course of study. All authors should be aware of the fact, also, that procrastination is a time waster so all authors must try to overcome this barrier as well. "Writer's Block" is another common barrier to the writing process. Simply defined, writer's block is an individual's inability to produce a piece of writing and/or to come up with some plan, or outline, for the piece of writing. Writer's block can occur among professional authors as well as novice authors and students. Lower your self expectations. No one is perfect. Change the place that you are currently using for your writing. A new location may promote and facilitate new and creative thoughts. A draft document, or a rough draft, is not a finished product. Instead, a rough draft gives the writer the opportunity to freely compose an imperfect product in a free-wheeling causal manner to that the author can return to it at a later time to perfect this imperfect first try. As you also learned in this previous section, the introduction to the essay should include interesting information that will be included in the body of the essay and perhaps even the importance of knowing about the information that will be included in the essay. Because the author may not know completely about the information that will be included in the rough draft, many hold off and postpone this introduction until the body of the work is done in a rough draft. Beginning with the conclusion may be particularly helpful to a person that is writing fiction or a narrative piece of writing. Both tell a story. Many times the author may not have already yet fully developed the characters in the story or the plot of the story, but they may have the end to the story in mind. While this ending is still fresh in the author's mind, the author may want to jot it down in a draft of the writing piece. Then, the author can return to the story and develop the plot and the characters in the story. Authors should not be afraid and terrified about making mistakes such as spelling or grammatical errors. There is plenty of time after the draft is done to proofread the draft for errors and to then correct any errors that were made in the rough draft. Authors should just keep plugging away until the rough draft is done and ready for the next step. Authors should not get discouraged; they should just keep moving along knowing that changes can be made to the document at a future time before the final submission. Authors should also try to stick to their planned outline or mind map, but, they should also feel free to alter, modify and change it as indicated and necessary to enhance the quality of the writing piece. The draft, again, is not the final product. Changes can, and should, be made to enhance the quality of the writing. Perhaps having a person, other than the author, to objectively read and critique the draft document for the author. After this critical review, the author should knowledgably and carefully consider the thoughts of the other person and either reject or accept their recommendations. The composition of a second, third and fourth draft document until the author is relatively certain that the final product is near and just about ready for the final proof reading and editing. Editing and proof reading the draft document can occur at several levels. This editing and proof reading typically begins with the author. For example, because a student or a professional author is fully and ultimately responsible for and accountable for proof reading and editing academic writings like term papers and reports, the editing and proof reading process begins with the author. At times, this process is followed by editing and proof reading the piece of writing by, for example, other people, professional reviewers and review boards when the professional author or professional in another field intend to submit a piece of writing to a professional journal. At the end of this editing and proof reading process, the writing product should be error free and of high quality once the necessary and/or desirable corrections are complete. It must be free of any spelling errors and grammatical errors. It should be checked and double checked for commonly occurring grammatical errors such as verb tense consistency, subject-verb agreement, word usage, and other errors. Deadlines are a fact of life. Teachers and professors have deadlines for the submission of their required term papers and research papers; publishing companies also have deadlines in terms of the submission of a manuscript for publication. Students and professional authors are told about deadlines. For example, students are typically told by their teachers about a deadline either orally or in writing when the deadline is incorporated into their assignment papers; and publication companies announce their deadline for the submission of a manuscript when an article is being solicited by and announced by that company. Deadlines must be adhered to. All submissions should be complete and submitted on or before the deadline, and not after it. Late submissions can have consequences for both the student and the professional author. For example, a student may get a penalty of 10% or a 0% failure for a late submission; and the professional author can be penalized with an automatic rejection of their manuscript, despite the fact that the author worked diligently on it, when it is not submitted in a timely manner on or before the deadline date. Authors must also submit their writings in the correct form. For example, some may require a submission via an email message or a drop box and others may require that a piece of writing is submitted in hard copy form. Still more, like the editorial boards for professional journals, may require multiple hard copies of a submission. Authors, whether they are students or professional writers, must be knowledgeable about and compliant with the formatting that is required by the person or group that the piece of writing will be submitted to. The writing style that must be used. For example, the APA or MLA writing style, as previously discussed, may be required. The paper size that must be used. The font that must be used.